Innovative Teaching & Learning and Technology! What's missing?… Ah, Physics!!! After a long period of hybernation the Croesy Physics online channel is about to become active again with a very exciting project that will see Croesyceiliog Yr13 Physics Students collaborating with learners at John Cabot Academy in Bristol to create and broadcast live online revision clubs! Helen Rogerson (@hrogerson) is John Cabot’s Head of Physics and she will support her students once a forenight in creating and broadcasting their sessions from Bristol, and I (@asober) will do the same with my students from Cwmbran. We will take it in turn to broadcast on our Croesy Physics Livestream channel and we would love to see many of you watching live and engaging with our students. In fact, there will be a 10 minutes Q&A session at the end of each event for the people who are watching from other schools, or from home. People can ask questions using the Livestream chat on the online channel, or by using the twitter hash tag #croesybot. Each session will also be available on demand after the event and we hope that our service will become a really useful revision tool for our learners as well as for students in other schools across the world! For help on setting up a similar activity see these resources I have uploaded on the TES website. “Vital” CPD brought to your home! 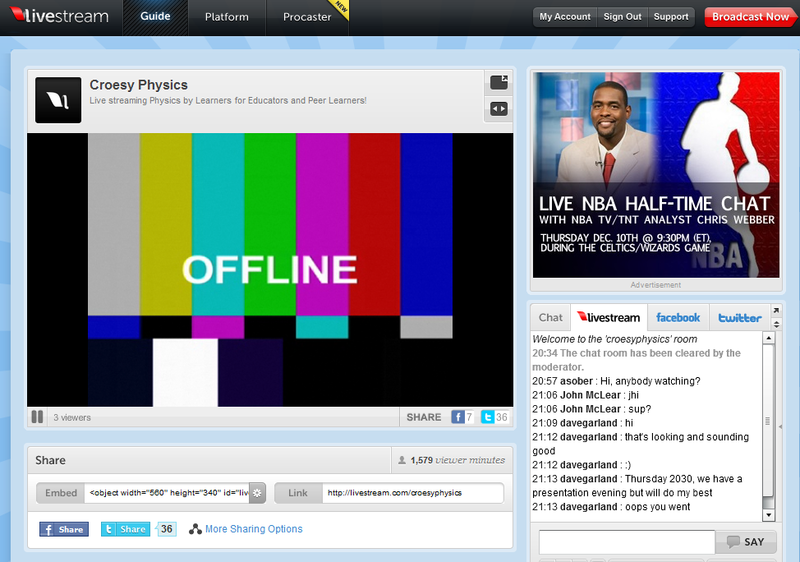 Last night I had the great pleasure and privilege to give an online workshop on Livestream and how my Yr10 classes used it to produce a “TV Show” on the EM Spectrum on our Croesy Physics TV channel (you can read more information about the project here). The CPD was organised by the great @stevebunce who works for Vital, an agency that provides great courses and opportunities for teachers’ professional development in England. I had joined two of these online workshops before as a spectator, and had the good fortune to see @deputymitchell showing the great work he does with his Primary Blogs! Vital uses a service called Elluminate, which allowed me to stream my face (the least interesting part of the course) from a webcam and/or send a screencast to all the attendees. I was quite amazed to find that I could even show Livestream and Procaster in action and I was broadcasting live on our NGfL Cymru Live channel on Livestream, whilst running the course on Elluminate. It was also very nice to be able to answer the questions from the audience that were posted on the chat room in Elluminate. You can now see the recording of the session here. This service that Vital provides is one of the best opportunities for CPD I have ever experienced. It just takes half an hour of your time and at a time of the day which is quite convenient to most people (even someone who has three little boys to put to bed like me)! In a time of financial difficulties that is seeing many schools tightening their CPD budget, Vital is showing great initiative, innovation and real understanding of teachers’ needs. Thanks Steve for another great opportunity. I am very proud and privileged to announce that Croesyceiliog School, for the second time in a row, will be represented at BETT for the great and innovative work its pupils produced in Physics. Last year our Yr12 students received a laptop each for their great News Report on how we used Google Wave to create a collaborative Physics revision club, but this year our “EM Spectrum Show” (that our Yr10 pupils produced to be broadcast live on the 17th December 2009) has been shortlisted as one of three Finalists in U.K. at the Guardian Classroom Innovation Awards. I am very grateful for all those who voted for our project and we hope you will continue to support us. We will present our project at BETT in the next few days and we would love you to come to the ASUS stand (K29) and vote for our project. I will present our project at stand K29 (ASUS) on Thursday 13th January at 11 am, so make sure you come and see us, if you are at BETT! Do kids learn much from a TV show? Well, yes when it’s them producing it! Needless to say they were very excited by the idea, especially because they were given complete choice on the type of activities they could create, the groups they were working with and even the software they could use. So, we got activities ranging from News Reports and Revision Songs to Documentaries and Comics. The whole process was highly enjoyable for them, to the point that some pupils who normally would not be that interested in the subject and that would find it difficult to focus on the work given became those who were always working very hard at their project and even came back at lunch time several times to make sure they could complete the activity in time to be broadcast. Our pupils used a range of sources of information to produce their activities. Many used the internet, but most also checked their facts on Science Textbooks and made sure that their content was both relevant to the AQA Specifications (our examination board) and scientifically sound! As I mentioned above, all groups had complete choice on the software and format they were using. So, some groups used Photo Story 3 to record short documentary-like videos.Photo Story 3 is very easy to use and very intuitive. It basically lets you choose a sequence of photos and record an oral narration on each frame. Other groups used Songsmith to create lovely revision songs. If you are a teacher, you can download Songsmith free by joining the Partners in Learning Network. Songsmith gives you a choice of musical bases and by singing to the software your voice is recorded and the base is turned into the melody you’ve created. You can then export your song in Movie Maker and add background images, text and effects, like our yr 10 pupils did. One of the highlights of our show was the News Report created by our pupils using only PowerPoint 2007 and Movie Maker. Michael asked permission to ITV News to use their music and he then produced the most amazing PowerPoint presentation I have ever seen. In this presentation he included the videos created by the other Reporters in Movie Maker and it looked really professional, as well as containing really good Physics. I think the most powerful message we could get from work like this is that we don’t really need to spend thousands of pounds in highly expensive equipment, nor have a state on the art recording studio in our school, because what really makes the difference is the creativity and engagement of our pupils. Some other groups used Community Clips to record their presentations directly from their computer screen. Community Clips is a very useful free tool from Microsoft Research that lets you record a video of whatever happens on your screen. You can also narrate what’s going on and your voice will be captured by Community Clips. A Good example of use of this software were the instructions made by our pupils on some useful websites for revision, towards the end of our show! So, how did we broadcast? Well, we used a free software called Procaster that lets you broadcast live directly on your Livestream channel. But the great thing about Procaster, and what makes it stand out from any other free broadcasting tool, is that you can choose to show just your webcam view, your screen, or a lovely 2-D or even 3-D mix of the two. The result looks very professional and the quality and speed of streaming is also pretty impressive for a completely free service. Your Livestream channel is also free and there is the option to let your audience interact with the show and with each other via the chat built in the channel. You can also link the channel to your Facebook and Twitter to maximise advertising possibilities. Our E.M. Spectrum show went live on Thursday 17th December 2009 at 20.30 (U.K. time) but it’s now available on demand in our Croesy Physics Livestream channel. Please, watch it and have fun! Have you ever used live streaming software, or websites? What was your experience? Puget Sound Center for Teaching who commented: “Dude. Really great. Or as you said it, Bringing Physics to Life is Amazing.” Les also asked our pupils: “What is the benefit of sharing your work in this online show?” and this are some of their comments. Michael: the benefits are that we are in control of our learning and the research that we did to produce the “TV show” allowed us to take everything in and understand all about what we were learning. Niall: some of the benefits would be the new and great technologies and software and being able to watch the show on the internet. Jess: the benefits are that your parents can see it and get involved with what you’re doing in school. Also, it was more fun knowing that lots of people can see it! Our Yr10 Physics students have worked on different activities of their choice to produce a “TV show” to be broadcast on the internet. The show will include various Physics demonstrations and revision activities on the Electromagnetic Spectrum and it should be very suitable for other Yr 10 pupils who are preparing for that topic and for Educators interested in the use of new technologies in Education. So, please forward this email to your pupils, colleagues, friends and relatives who might be interested! I will broadcast live from my home the work of my pupils, which has been pre-recorded in class. My pupils and I are quite excited about this project and they are putting together a nice set of resources. It is the first time we attempt something like this in the Physics Department at Croesyceiliog School and we would really appreciate your participation and feedback on the outcomes! Office Live: a useless online collaborative environment? The result was that each pupil in yr 12 was assigned a topic and turn that into a mind map on a single slide. Thanks to the zooming features of PPTplex there was no concern about the font size and students could, therefore, fit as much information as they wanted in their mind map. Each slide was a new central concept within a much larger mind map whose template I designed in the background view to include all the pupils’ slides and show how each topic linked with each other! This way they could all work at the same mind map presentation and that saved the hassle to have to collect all their work and paste it in a single presentation afterwards. In addition, it allowed the students to use the amazing features of Office 2007, like smart arts and PPTplex and create really nice and visual mind maps! So, did it all work so smoothly? Well, we live in the real work! I already knew about the problem of not being able to work simultaneously on the same file. If someone is currently working on one file another user can only open it as a read only. This takes away all the collaborative nature of sharing documents online, doesn’t it? No doubt, tools like Google Docs and Google Wave allow a much superior real time collaboration, but the tools provided by Google Presentations are quite limited compared to the range of features of PowerPoint 2007, which allows the user to create much more versatile and professional looking presentations, as example of which is PPTplex. Some students could not download the Presentation and work on it and one pupil experienced the frustration of not being able to edit the presentation because another student was working on it at the same time. Thankfully, he was quick enough to think of saving it with another name, make his changes and then cut and paste onto the Office Live shared presentation later. What so you think? Please, leave a comment!